WE WELCOME NEWCOMERS AND FIRST TIMERS AND WE HAVE EVERYTHING YOU NEED ON BOARD! We are located at 310 Harbor drive in Sausalito in Clipper Yacht Harbor, and there is plenty of free parking. At the end of Harbor Dr there is a railroad crossing type of gate at the entrance to the “main” parking lot. This gate is usually closed early in the morning but often you can follow someone through or someone might open it for you… IF you use this lot please park in spots to the left as spots to the right should be left open for patrons of “Fish.” Restaurant later in the day. There is however, ANOTHER LOT !! Many seem to miss it but it is 100 feet before the gate - to the right. This is the preferred lot to park in but please do not park in any spot marked “reserved.” On busy days this smaller lot can get full, and if you can’t get into the big, “main” lot, call us at (415)548-0150 and we can always come open the main lot gate for you. Our dock is basically straight across from that "RR crossing" type gate... right next to the boat launch ramp - and we are 3/4 of the way down that dock on the left "Salty Lady" - come straight to the boat and pay on board. 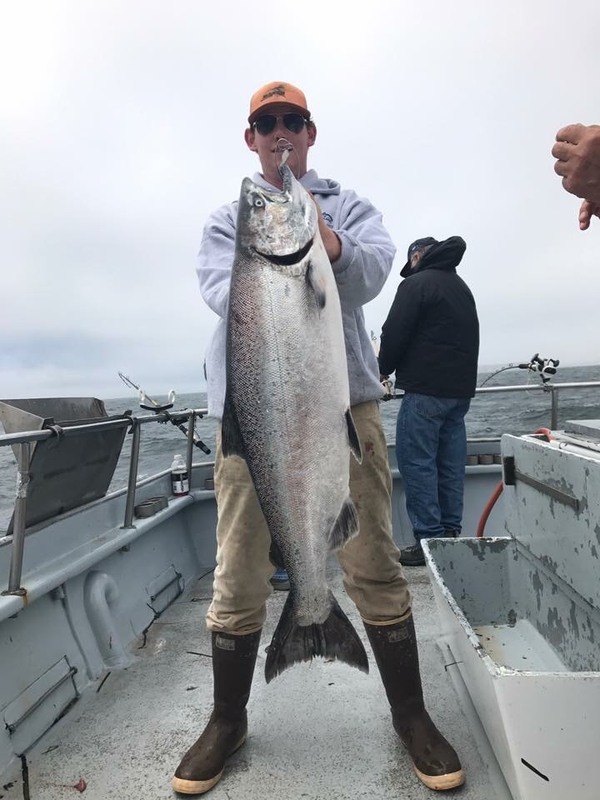 Aside from the Salmon trolling weights, all terminal tackle - including smaller weights for live bait or rock cod fishing, hooks, leaders, flashers, weight releases, bait, etc - is provided and included for no charge. We’re stocked up on the tackle that works !! While there is a LOT of tackle designed to catch fishermen, we actually like to catch fish !! If you’re bringing your own rod, a medium/heavy rod rated for 20-30lb test line would be a good choice, paired with a medium/heavy baitcasting reel. Spinning reels are not recommended. We like to fish braided line, so please make sure it has a “top shot” of around 150 feet of 40-50lb braided line… (it is not necessary to spool the entire reel). We use 40lb Berkeley Power Pro on our rental rods. 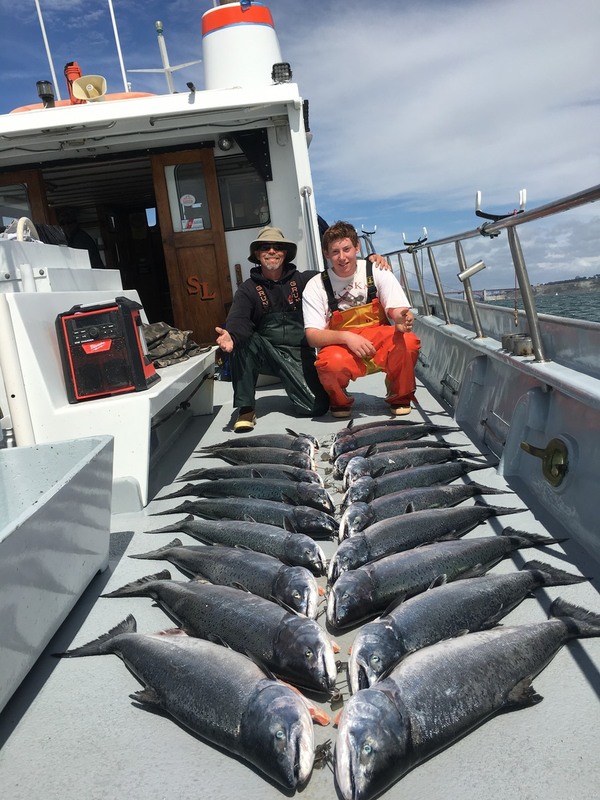 Due to current regulations we cannot sell fishing licenses on board. They can be purchased at your local sporting goods store or online at the Ca Dept of Fish and Wildlife website. Coffee and tea are provided and we do have a microwave but bring your own lunch and cold drinks. Beer, wine or other alcoholic beverages ARE permitted and even encouraged... Becoming inebriated is discouraged and not a great idea on any boat !!! Dress appropriately… regardless of how hot it may be on land it can often be very cold on the water. It might be warm… but don’t count on it. Layers !!! Overall, seasickness is very rare… it happens to a very small percentage of people… but if it happens to you it can make for a very long day. Seasickness medications do NOT work if you wait until you start feeling the symptoms !! They DO work very well if you take one the night before and one in the morning before you leave to come down to the boat. Our trips leave PROMPTLY at 6:00 am so please be on the boat by 5:00 - 5:30 !!! We usually return to the dock by 3:00-4:00 pm at the latest.